The outcry against Legislative District One Republican Representative David Stringer has grown since the publication of his racist remarks. This condemnation includes a group of local activists in LD 1 who will meet this weekend to discuss launching a recall drive of Mr. Stringer if he does not immediately resign from his elected office. Legislative District One includes all or parts of Yavapai and Maricopa County. Prescott, Prescott Valley, Anthem, New River, and Cave Creek are included in this Republican-leaning district. When Mr. Stringer’s earlier comments about school classrooms not having enough white kids first surfaced, Republican Governor Doug Ducey and the Yavapai County Republican Party called for the Prescott Representative to step down. He ignored this and won re-election on November 6, 2018. With these latest remarks, the Governor and county party reaffirmed their wish for Mr. Stringer to resign. The Arizona Republican Party Chairperson Jonathan Lines echoed those remarks. The Prescott City Council, in a nonbinding resolution on December 4, 2018, called for Mr. Stringer to resign. The Prescott Valley City Council will be meeting on December 6, 2018, to consider a similar resolution. Republican leaders and organizations like Speaker-elect Rusty Bowers and the Republican Women of Prescott have condemned his comments. The Republican Women of Prescott commented that Mr. Stringer’s sentiments were “racist, divisive and inappropriate. There is no place in our conservative Republican values for these opinions and remarks.” Mr. Bowers removed him from the chairmanship of a committee but then disbanded the committee. Democratic and Progressive Activists have also weighed in. The East Valley branch of the NAACP has recommended a boycott of groups to schedule events in Prescott until Mr. Stringer resigns. Along with the Democratic Minority House Leader Reginald Bolding and other legislators, the LD 1 Democrats have also called for Mr. Stringer to leave. 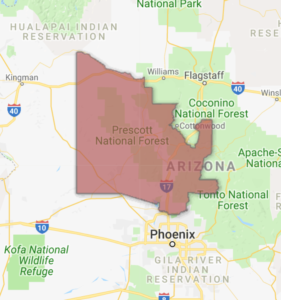 Yavapai Democratic Party County Chairperson Toni Denis helped issue a press release that chastised Springer for his comments, relaying that “there is no place for institutional racism in Prescott, Yavapai County and in the state of Arizona. Our board voted unanimously on a resolution to ask Rep. Stringer to resign from his seat. He has no business in a position of authority in which he is capable of making policy that negatively impacts children and adults of different backgrounds, races, creeds, and colors.” Furthermore, the press release asserts that “Stringer represents the worst kind of narrow, bigoted thinking that ignores what has been this country’s greatest strength—its combination of people from all backgrounds and all races, who contribute to its economic, cultural and creative foundations.” In an interview, Ms. Denis relayed that she felt Mr. Springer thinks he is right with his views and would be too stubborn to resign. There are local organizers in LD 1 who agree with Ms. Denis that if the Republican Governor cannot convince Mr. Stringer to resign, he is not going to. These organizers think that the recall method needs to be employed to remove Mr. Stringer from office. One of these organizers, Nicky Indicavitch has known of Mr. Stringer’s spoken and written extremist views for several years since he ran for a seat on the Prescott Unified School District Governing Board. Protected up until recently by a conservative-leaning local media, Indicavitch stated that Mr. Stringer (who is one of the owners of the conservative online Prescott E-News) was able to amass a sizable campaign war chest (with out of state donations from organizations that subscribe to the educational views of Betsy DeVos) and appeal to an anti-tax conservative base while the local Republican community largely ignored his more reactionary views on privatizing education, immigration, and race. These donations and the conservative leanings of the district helped Mr. Stringer fend off a primary challenge in August and defeat two Democrats in November. Ms. Indicavitch and many local activists and organizers like her, experienced in the Invest in Ed drive, are not waiting for Stringer to wait out the news cycle in the hopes that people will forget about his inappropriate comments. They have researched the process involved in launching a recall drive of an elected official. They will be meeting this weekend to finalize this plan and will, since Stringer is an incumbent, probably initiate the recall process this month. The reactionary strain in the Republican-Trump Party has produced individuals in recent history (Russell Pierce and Don Shooter for example) that needed political remedies (recall for Pierce and expulsion for Shooter) to remove them from office because they lacked the decency and good sense to resign. Based on the people who have experienced Mr. Stringer the most over the last few years, it is apparent that recall may be the only option to remove him if the State Legislature does not take the step to expel him. It is unfortunate that extremists like Mr. Stringer are able to attract a following, including a “white nationalist” minority that can subscribe to the ideas in his writings and propel him to an office where he can have a platform to spread his vile ideas. Fortunately, there are mechanisms our system provides for to cleanse the system of the vile extremism people like Mr. Stringer represent. Vote mafia, election rigging gangsters are vile. I take umbrage to the Trump republican bias and fallacies. I am a Republican because of Trump. Our family goes back a long way with the family Trump. Family lore has my grandfather, my uncle, and Knights of Columbus members in Queens, 1927, with Fred Trump; along with 100 Catholic cops, went up against 1800-2400 KKK members bent on marching without a permit. The clan never came back to NYC after that riot. Racism is a belief system that is taught from father to son. Fred Trump wasn’t a racist. His deeds speak for themselves. So, I resent the blanket smear when Obamarama dingdong democrats play the “racist card” against Trump and fellow Republicans. I am white and married to Chinese. So don’t play the “racist card” or “Trump is a racist” trash on me. The lowest black unemployment rate in history is just one of many financial stats showing blacks are benefiting with Trump. I resent the racist tag and see it as democratic brainwashing. Walk away! I am a patriot and veteran that carried a rifle to defend freedom of expression. Lighten up, Roseanne! In sum, the biased author was correct, “Fortunately, there are mechanisms our system provides for to cleanse the system,” and it’s called the voting booth. I umbrage to the Trump republican bias and fallacies. Stringer donated $140,000 to his 2016 Legislative campaign and another $140,000 to his 2018 re-election campaign. Neither individual candidates nor special interest groups should be allowed to buy seats in the Legislature or the Congress.